Holding its gala grand opening in April 1983, with Kabuki from the National Theatre of Japan, the Aratani Theatre has been a cultural pillar in Little Tokyo for the last three decades. More than $4.2 million of the $6.4 million cost of the Theatre was raised in Japan by a group headed by former Ambassador to the United States, Nobuhiko Ushiba, and Shintaro Fukushima, chairman of the Japan Times. Today, the Aratani Theatre continues to be at the epicenter of Japanese and Japanese American performing arts, and it is also shared by the arts community to showcase the vibrancy and diverse cultures of Southern California and beyond. Fan-shaped with good sightlines unhampered by posts, it is a perfect, intimate and comfortable venue for chamber music, dance and drama. A partnership between Bose® and the Japanese American Cultural & Community Center has made it possible for the Aratani Theatre to be the first performing arts venue in Southern California to house a newly custom-designed Bose® RoomMatch® sound system. A total audio refit was completed in November 2014 with Bose’s innovative technologies, bringing the theatre’s acoustic performance to new levels of excellence. Thanks to the partnership and generous support of Bose®, the Aratani Theatre now provides the finest listening experience for its audiences and is a premier venue for artists who value quality sound in an intimate environment. 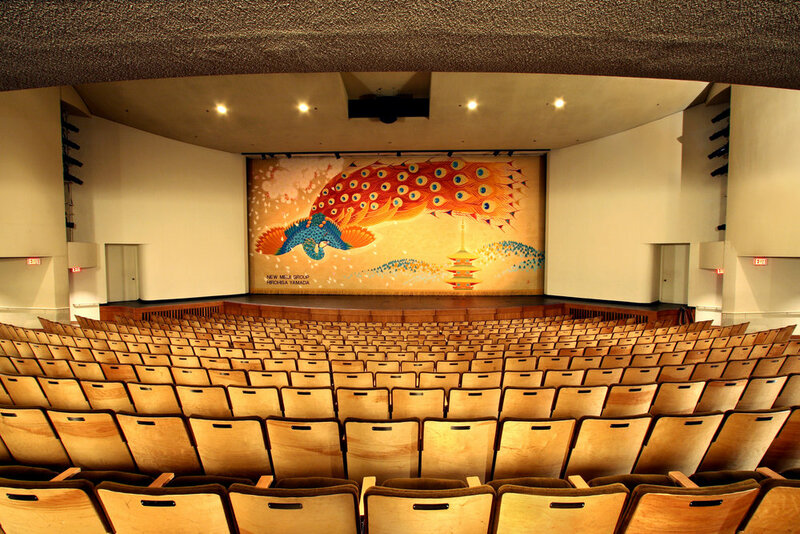 Another unique feature of the Theatre is the custom-made doncho (curtain) of handwoven silk, made in Kyoto, featuring a colorful giant peacock soaring over a flurry of cherry blossom petals. The only other donchos in the United States are in the John F. Kennedy Center for the Performing Arts in Washington, D.C., and Radio City Music Hall in New York. Since 2014, JACCC and our supporters helped to complete a new phase of technical upgrades in the Aratani Theatre. Their generous support has helped to infuse the theatre with its new sound, lights, rigging, soft goods and projection systems. The Aratani Theatre Lighting Upgrade Project was been made possible in part by generous support from George, Ruri, Lisa & Nathan Sugimoto, the Ahmanson Foundation, Aratani Foundation, Henry Ota in memory of Sue and Harry Ota, Akira Uehara, Kawaguchi-Kihara Memorial Foundation, and the Folick Family. Significant in-kind support for the Aratani Theatre has been provided by Bose Professional, Ushio America, Inc., and NEC Display Solutions. To inquire about renting the Aratani Theatre, please complete the following forms and submit to Carol Onaga at onaga@jaccc.org.